As discussed in the preview, Ange Postecoglou had one major selection headache in midfield, where he rotated between five different players for the left-of-centre position. Mark Milligan kept his place from the semi-final win over the UAE, meaning this was the first time in this tournament that the Socceroos had the same starting XI for two consecutive games. Uli Stielike sprung a surprise by picking Jang Hyun-soo, which meant Park Joo-Hoo, who had been ever-present alongside Ki Seung-yung in central midfield, moved to the left wing. This also meant Son Heung-min switched to the right. Stielike’s decision to switch Son to the right was surprising as the Bayer Leverkusen winger had been excellent on the left in the knockout stage. He scored twice in the quarter-final against Uzbekistan and was the brightest player against Iraq, drifting into pockets of space to receive forward passes, before turning and running directly towards goal. On the right, he had a different role that was the biggest tactical feature of the opening fifteen minutes. 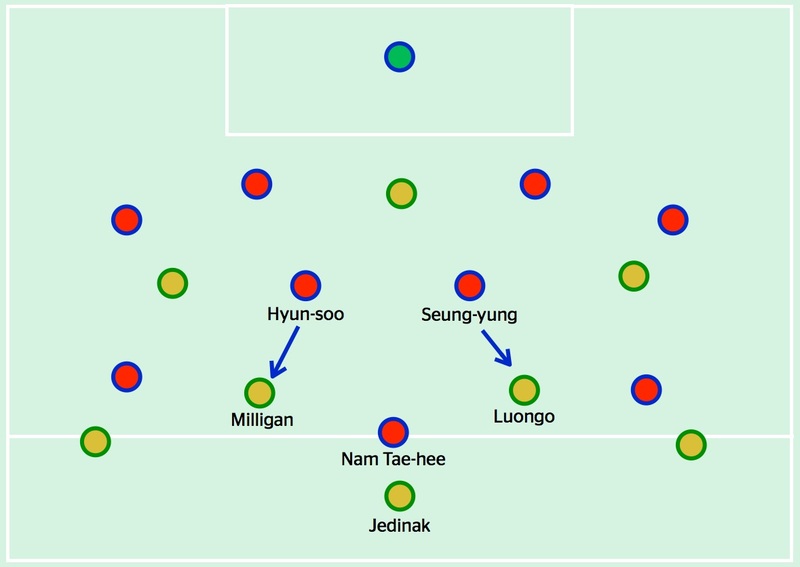 When Korea had possession, they worked the ball forward slowly down their left hand side, with Son holding a wide position on the opposite flank. This meant he was free to receive a quick, diagonal pass that switched the point of attack and created opportunities for Son to take Jason Davidson on 1v1. Twice inside the opening fifteen minutes, Son dribbled into a central position to shoot. Son also had an important role defensively. When Australia’s centre-backs had possession, Son positioned himself quite narrow, blocking the forward pass towards Leckie. This meant Davidson was often free to receive passes from Spiranovic, which explains the aforementioned pass combination between the two, which was the most frequent in the game. When this pass was made, it was the cue for Son to quickly close down Davidson. The left-back had little time on the ball, and was often forced to return the pass back to Spiranovic. After fifteen minutes, the expected pattern of the game emerged. As predicted in the preview, Australia dominated possession, with Korea predominantly looking to play on the break – the same pattern from their previous meeting in the group stage. However, Korea adjusted their defensive approach slightly. In the first meeting, Korea focused on defending very compactly in two banks of four – they got behind the ball quickly and created a wall of defenders that Australia had trouble breaking down. Here, they wanted to press in midfield, preventing Mark Milligan and Massimo Luongo from receiving passes facing forward. This was similar to how China defended in the quarter-final, with Zheng Zhi and Wu Xi working hard to ensure Australia’s possession was limited to their own half, making it difficult for them to work the ball forward into the final third. Here, Korea’s #10, Nam Tae-hee, shadowed Mile Jedinak, with Ki Sung-yeung and Jang Hyun-soo moving forward onto Massimo Luongo and Milligan whenever a forward pass was played. The two Australian centre-backs, Trent Sainsbury and Matthew Spiranovic, recorded reasonably high pass completion rates, but the majority of this was towards the flanks – the most common passing combination in the match, for example, was Spiranovic passing to Davidson (10). However, Australia persisted with their attempts to play forward from the back, and were rewarded when Sainsbury found Luongo between the lines. The Swindon Town midfielder took a brilliant first touch to face forward, before scoring with a fine low shot from outside the box. On a small sidenote, it was unsurprising Sainsbury assisted the goal. Like against China, he recognised that the opposition were pressing in midfield, and often pushed forward on the ball into the midfield zone to create an overload. Sainsbury was Australia’s most penetrative passer in the quarter-final, and likewise here in the final. The goal was something of an exception to the fact that Korea defended well and prevented Australia from creating many clear-cut chances (Luongo’s shot was, tellingly, Australia’s second attempt on target). Their pressing in midfield also meant they were able to win the ball reasonably high up the pitch, and launch quick counter-attacks. The area of greatest promise, however, was down their left hand side. When Australia defend, Robbie Kruse takes up a very narrow position, looking to close ‘inwards’ on the opposition central midfielders. If the opposition left-back moves forward, the right-sided central midfielder, Luongo, moves out towards the flank to close them down. This has been a feature of Australia’s defensive setup throughout the tournament, and was first noticeable in a friendly against Japan back in October. Here, it caused problems because Korea’s left-back, Kim Jin-Su, frequently motored forward, with Luongo having lots of ground to cover, which gave Jin-su time and space on the ball out wide. It was Jin-su’s cross for Son, who lashed the resulting volley over the bar, that resulted in Korea’s best chance, and summed up his attacking threat. At 1-0 down, however, Stielike turned to his bench to find an equaliser. First, he brought on Lee Keun-ho, then Han Kook-young, in what were fairly straightforward swaps for Nam Tae-hee and Park Joo-Hoo. His third and final change was the most drastic of the game, however. Centre-back Kim Ju-young came on for Lee Jeong-hyeop, meaning Stielike was replacing a striker with a defender. The substitution was made so Kwak Tae-hwi could go upfront. The tall centre-back became a target for long balls, with Korea essentially lumping balls into the box. Their very direct, somewhat desperate approach in the final fifteen minutes paid off, when a long ball, won by Tae-hwi, eventually fell to Son Heung-min inside the penalty box. He scored from close range to take the game to extra time. Stielike’s substitution got them back in the game, but meant they struggled in the following thirty minutes of extra time. Tae-hwi moved into midfield, with Hyun-soo going upfront – his visible cramp demonstrated Korea’s problems with fatigue during this period. It’s difficult to quantify, but Australia simply seemed fresher – something Postecoglou said post-match that he emphasised during his team talk at the end of ninety minutes. This was now less a tactical battle, and more a physical battle. It was hardly surprising the two freshest Australian players, Tomi Juric and James Troisi, both played a part in the goal – Juric pressuring high up to win the ball back quickly, and then somehow inexplicably squeezing past two defenders to square a pass across the face of goal. Troisi darted forward to tap in the winner. This was a victory for Ange Postecoglou. He took the job in October 2013 with the remit of regenerating the squad and instilling a proactive, modern style of play. At the time, even with a World Cup coming in 2014, Postecoglou pointed to this Asian Cup as the true test of his tenure, asking fans to judge him on the basis of the performance in this tournament. In every game, Australia has dominated possession, nearly always controlling the ball inside the opposition half. They have, for the vast majority of their six games, been the side in control, and have continued to play positive, attack-minded football no matter the scoreline. This has been the Postecoglou way. Fittingly, the final was further vindication of his methods. The opening goal came from the centre-backs determination to play forward into midfield. Luongo, one of the players who has benefitted from Postecoglou’s emphasis on youth, was a fitting scorer. Then, deep into extra-time, two substitutes combined to score the winning goal – two players, who, like Luongo, were barely involved under the previous regime. They are beneficiaries of Postecoglou’s desire to create depth in the squad, which explains why 46 players have been used across the two years of his reign. There are question marks about the significance of the Asian Cup on a global scale, but for Australia, winning the tournament represents a landmark moment in their development as a football nation.